Every now and then I come across a recipe in my Dutch cookbooks that surprises me once I try it. 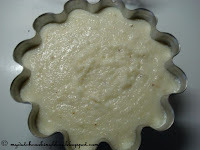 A traditional dessert called "griesmeelpudding" (grits pudding) sounded old-fashioned even when I was a little girl. My grandma never even made it, that's how old fashioned it was, imagine that! Anyway, "griesmeelpudding" did not sound appetizing, partly because of its perceived high "last century" factor, partly because the name "gries" (grits) forms also, phonetically, the first syllable for the verb "griezelen", i.e. shudder in horror ( a "griezelfilm" is a horror movie). 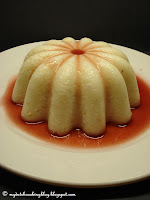 Kids would often refer to the pudding as "griezelpudding" and would not eat it. No wonder! But in my quest to cover the traditional Dutch kitchen, I cannot circumvent something so typically Dutch. And after deliberately cooking and baking twenty other things, I've finally come full circle and decided to tackle the griesmeelpudding. And I am SO glad I did!! There is something inheritently comforting in the smell of warm milk with sugar. I don't know if it's because my grandma would make "lammetjespap" for me every so often and it reminds me of being a child, or whether it's a nurturing thing. No clue. But when I stand over the stove, warming up milk and stirring sweet sugar into it, I get this homey, warm, fuzzy feeling, perfect for these cold days. The "griesmeelpudding" is very similar to rice pudding, as we know it here in the United States, but the berry sauce most definitely adds a characteristic and flavorful angle to it. It can be rewarmed but does not look so pretty. I did like it warm better but it is winter and anything warm is good. It is a definite comfort food. Very comfortable indeed. Again my mom and south Germany: I think they made it there with farina. This gives it a finer texture.. or maybe that was just what she told me to get me to eat left over Cream of Wheat. Ik ga dit probeeren! Ben gek op griesmeelpudding! Hi Marcella! Let me know how it turned out, it's become one of my favorite desserts....so easy to make and so flavorful, and very comforting. Thanks for stopping by, don't be a stranger! Dit heeft niks met griesmeelpudding te maken. Griesmeelpudding = semolina pudding. Kan evengoed wel lekker zijn, maar griesmeelpudding, nee. Aha yes, that makes more sense. 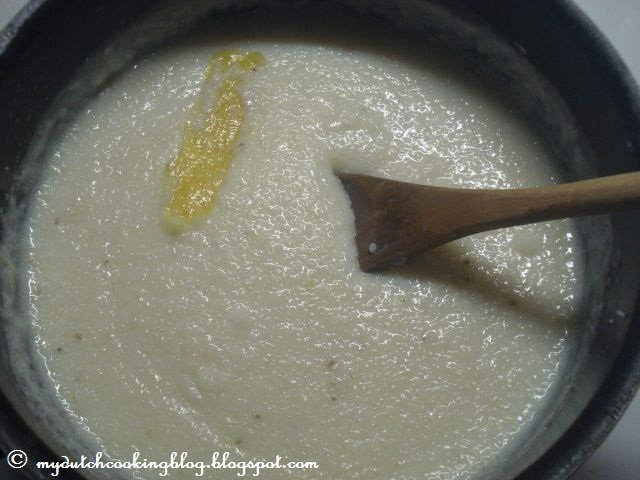 Semolina is well nice. I had the unfortunate experience of eating Grits for breakfast while on holiday in Louisiana somewhere. Truly horrible.